Traditionally there has always been, in the hearts and minds of committed Catholics, a great reverence for the priesthood. In respecting priests we are doing so because His ministry as ‘alter Christus’ or ‘other Christ’ gives witness to Christ in society. Marion Mulhall, a successful business entrepreneur in the advertising world before and in the early part of the so-called ‘Celtic Tiger’ years (1994-2008) in Ireland, embarked on a mission, following a weekend retreat on 15 January 1994. The fruits of Marion’s realisations during that weekend have, since then, produced a rich harvest of prayerful support for priests worldwide. How she came to devote her talents and energy to this unique ministry is the fascinating story of a woman replacing her business concerns with an urgent response to a very different vocation. ‘I believe one of the greatest gifts the world has received is the priesthood of Jesus Christ, but through time the recognition and acceptance of this gift has become somewhat overshadowed, at times, indeed almost eclipsed from the hearts and minds of people’ was how Marion prefaced her first major project, a 1997 video production entitled Called to Serve As Priest. Marion was educated at the Dominican Convent, in the town of Wicklow, Ireland, where she displayed a flair for art. She pursued her goal of making a career in the competitive field of graphic design/ advertising/ communications by enrolling in the National College of Art and Design, Dublin. While in college her talents were spotted and she secured employment as a graphic designer with O’Keeffe’s Advertising, one of the top advertising agencies in Dublin at the time. During her time in the agency she cherished an ambition to eventually set up her own business and within a few years she achieved this goal, running her own business and serving the needs of various corporate sectors, including the bloodstock industry. Her impressive portfolio of work relating to ‘the Sport of Kings’ which included commissioned projects for The Cartier Million Race Meeting, the centenary magazine for Leopardstown Race Course and various promotions for the Irish National Stud in County Kildare. Today, Marion is more concerned with the spiritual support of priests than with the ephemeral concerns of the commercial world. To learn how Marion’s life took – in the words of Robert Frost – ‘the road less travelled’ and how her business was transformed into a leading agency for church communications we must reel in the years to mid-January 1994. Marion, a lay Carmelite, had been invited by Fr. Kevin Scallon CM to attend a weekend retreat, a short distance outside the city of Derry in Northern Ireland. Initially, Marion, who had never been to Derry previously, had decided not to travel because of the political unrest in Northern Ireland at the time, but changed her plans when the then Bishop of Raphoe, Dr. Seamus Hegarty, asked her to meet him on the Friday. This happened to coincide with the beginning of the retreat and she felt drawn to join Fr. Scallon’s Croist Linn gathering of prayer. On the following day, Saturday 15 January 1994, at precisely 4.40 pm, as she was being ‘prayed with’ by Fr. Kevin Scallon, Marion became clearly aware of her vocation ‘to promote the priesthood at any price’. Marion’s response was immediate, when providentially; she contacted Monsignor Andrew Cusack of Seton Hall University, New Jersey, founder of the International Institute for Ongoing Clergy Formation, who happened to be in Ireland for the month. 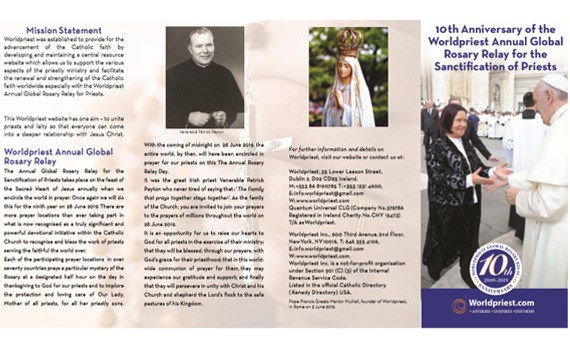 Marion arranged to meet him, and as a result of their meeting, she was invited to make her first visit to America to address bishops and priests each evening at a conference of the summer programme organised by the International Institute for Ongoing Clergy Formation, held at Seton Hall University, South Orange, New Jersey. Additional episcopal doors opened for Marion after the late Cardinal John O’Connor of New York gave his blessing and support to Marion’s apostolate. Marion Mulhall is the founder and CEO of Worldpriest, a lay organisation of professional communications people formed in 2003 to ‘Affirm the dignity, beauty and gift of the Priesthood of Jesus Christ to Humanity’. 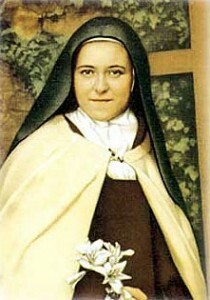 She is the inspiration behind worldpriestday.com which she formed in response to Blessed John Paul’s announcement of a World Day of Prayer for the Sanctification of Priests to be held annually on the feast of the Sacred Heart of Jesus. Marion and her team are the developers and the inspiration behind the Annual Global Rosary Relay for the Sanctification of Priests. The idea is a simple one: each of the participating shrines around the world prays a particular mystery of the Rosary at a particular half hour in thanksgiving to God for our priests and to implore the protection and loving care of Our Lady, Mother of all priests, for all her priestly sons. At midnight on the Annual Global Rosary Relay day, which falls on the feast of The Sacred Heart of Jesus, the entire world, is encircled in prayer for our priests. The Annual Global Rosary Relay Day for the Sanctification of Priests, has fast become one of the largest gatherings of a world at prayer for one purpose, one prayer, one day. Marion has appeared on international television programmes including EWTN’s Live in Alabama USA. She has addressed the USA Bishops’ Conference, and many other prestigious gatherings globally, sharing her life’s passion and mission of supporting the priests who serve us faithfully in Christ’s name. Worldpriest is a not-for-profit organisation with offices in Dublin, Ireland and New York, USA. to thereby obtain the revelation of your Glory.